Edward Gorey. 1000 piece puzzle. 20" x 27". The acclaimed author-artist Edward Gorey had a lifelong interest in the theater. His participation in the Broadway production of Dracula garnered three Tony Award nominations, and he wrote and produced engaging and quirky plays that appeared both on and off Broadway and on Cape Cod. As a world-class balletomane, Gorey (1925–2000) was known for having attended most of the performances of the New York City Ballet between 1957 and 1983—the years of George Balanchine’s reign as the company’s choreographer and artistic director. 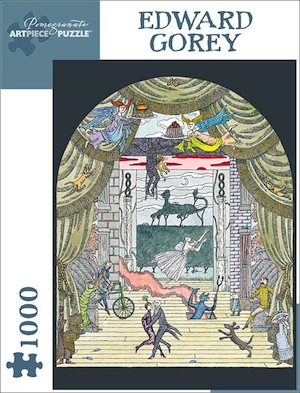 The untitled, gleefully chaotic work reproduced in this puzzle might be seen as Gorey’s celebration of the theater, which brought him great pleasure and inspiration.